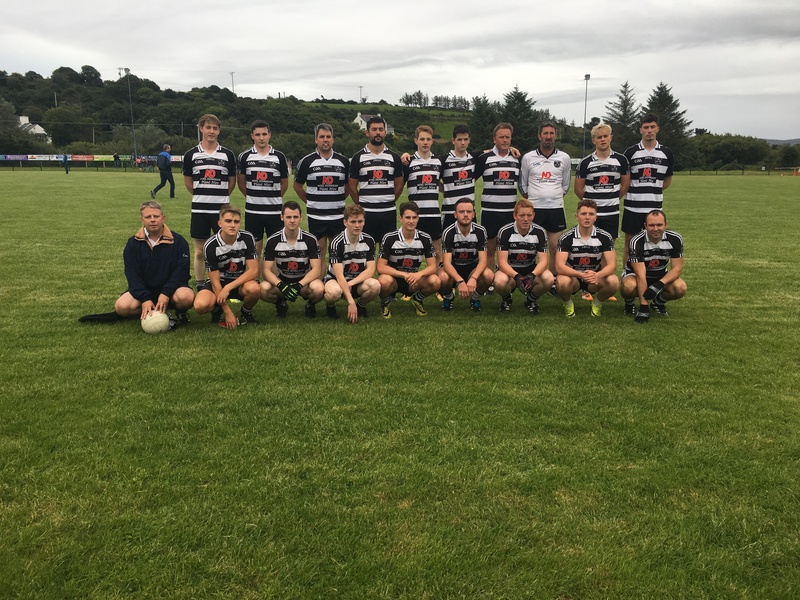 Despite 2 late goals from Glengarriff, it was Castletownbere that emerged victorious in the the Beara junior B semi final played at Adrigole last Saturday. Right from the throw in Castletownbere stormed into a 2 point lead with points from Dean Murphy and Jason Walsh within the first 2 minutes. Sean McCarthy got Glengarriff on the scoreboard after 3 minutes but Castletownbere preceded to score points from Liam Hanley and Dean Murphy and when Liam Hanley made a powerful run through the heart of the Glengarriff defense, it was Sean O’ Regan who was at the of the superb move to find the back of the Glengarriff net to give Castletownbere a 1-4 to 0-1 lead after 12 minutes. A response from Glengarriff was needed and this was found with pointed frees from Shaun Clar O’ Sullivan and Sean McCarthy and an excellent point from play from Conor Galvin that left the score 1-4 to 0-4 after 17 minutes. Castletownbere having a number of players from their county intermediate winning team of 2012 in their ranks started to make their experience tell, Donnagh Bawn O’ Sullivan kicked a point in the 20th minute and when a Castletownbere shot rebounded off the crossbar it was John Paul Sheehan who reacted quickest to score a goal from close range to leave the score 2-5 to 0-4 after 22 minutes. Shaun Clar O’ Sullivan quickly replied for Glengarriff, and with Liam Hanley and Sean McCarthy trading points before half time, Castletownbere lead at half time 2-6 to 0-6 at half time. After a highly entertaining first half with expansive football to the fore, the 2nd half proved to be a much tighter affair. Castletownbere again were quick out of the blocks with a Adam Hurley free and a Craig Murphy point to give Castletownbere a 8 point cushion. Conor Galvin replied in the 36th minute to reduce the lead to 7 in the 36th minute. Castletownbere again replied with 2 points from Adam Hurley and 1 from Cormac Whelan gave Castletownbere a 10 point lead after 47 minutes. Points from Jack Hurley and 2 from Sean McCarthy reduced the lead to 8 after 58 minutes but when Fiachra Murphy swung over a well taken point in the 59th minute that seemed to be that. The referee after consultation with his umpires issued a 2 yellow card to a Castletownbere player in the the 60th minute and this sparked Glengarriff into life. Paul Pad O’ Sullivan scored a goal in the 61st minute. Also immediately after the kick out Glengarriff surged forward and were awarded a penalty in 62nd minute and this was expertly finished to the net by Shaun Clar O’ Sullivan. 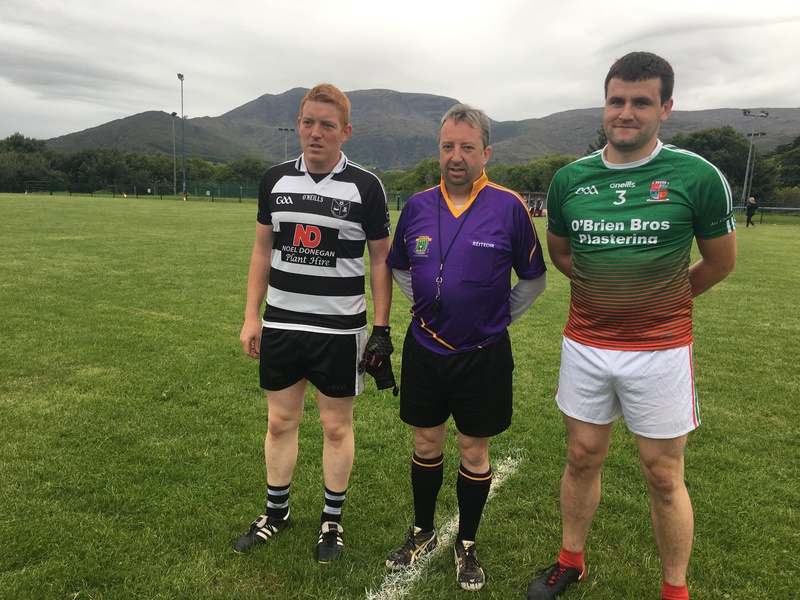 Sensing a draw was on the cards Glengarriff threw everything forward but despite a great opportunity they were unable to find the elusive 3rd goal and it was Castletownbere that held on to win 2-12 to 2-9. Castletownbere. 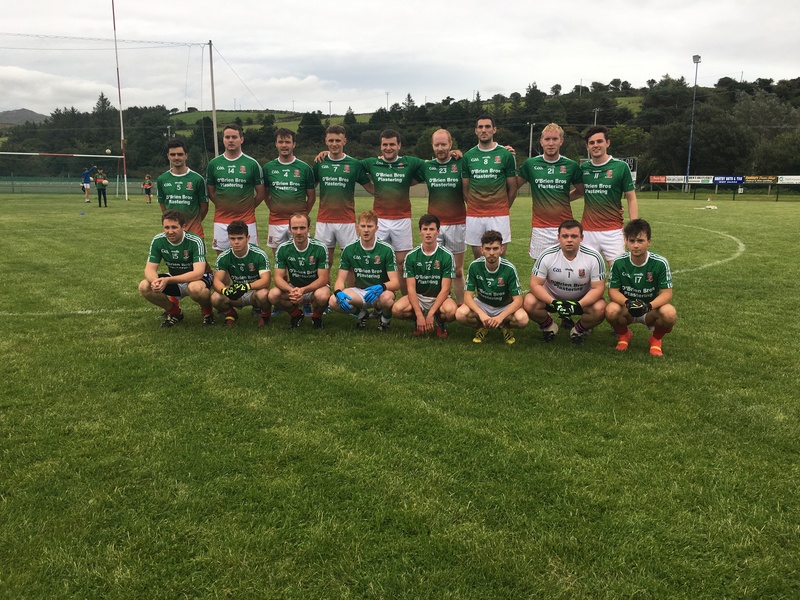 David Kelly, Sean Walsh, Sean B O’ Sullivan, James Musgrove, Michael Murphy, Donagh B O’Sullivan, Fiachra Murphy, Liam Hanley (Captain), Dean Murphy, Cormac Whelan, Jason Walsh, Craig Murphy, Adam Hurley, John Paul Sheehan, Sean O’ Regan. Glengarriff. Jack Hurley, Denis McCarthy, Finbarr McCarthy (Captain), Stephen O’ Sullivan, Tomas Harrington, Paudie O’ Sullivan, Tony Harrington, Danny Galvin, Gearoid O’ Sullivan, Paul P O’ Sullivan, Conor Galvin, Eoghan McElhinney, Sean McCarthy, Shaun Clar O’ Sullivan, Chris Harrington.